Patsy Dugger is a native of Memphis, TN. She attended Southside High School and graduated in the Scrappers Class of 1982. After graduating from High School she married Rickey L Dugger, Sr., and relocated to Houston, Texas. After marrying Rickey Dugger they resided in Houston, Texas for 10 years and was then relocated to Little Rock, AR where they resided for 4 years until the Lord saw fit to bring them back to Memphis when Dr. Rickey L. Dugger became the Senior Pastor of the Norris Ave. M. B. Baptist Church. Mrs. Dugger served as the President of the Baptist Minister’s Wives Guild of Memphis and Vicinity for 4 years. 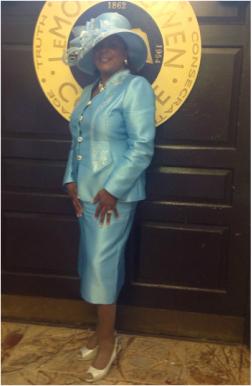 She also serves as one of the chairpersons for the UNCF First ladies Tea at Lemoyne Owen College where she was selected as “WOMEN OF THE YEAR FOR 2014”. She also serves as one of the chairpersons for the Annual Sisters Network 1st Ladies Prayer Brunch for Breast Cancer Survivors. She is the Advisor of the Generation Plus better known as the G-Plus Senior Ministry at her church. Pastor and First Lady Dugger have been blessed with two beautiful children; Rickey L. Dugger Jr. (Wife - Lametria) and Gabrielle Sehar (Husband - David). Additionally, they've also been blessed with seven grandchildren; Alaiya, Rickey III, Selah, Cecelia, Autumn, Jahari, and Jaden. They have shared 36 beautiful years of marriage. She has a love for God’s people and is willing to help in any way that she can. She truly loves her family and her Church family. Mrs. Dugger’s motto is: “If I can help somebody as I pass along then my living shall not be in vain in the Lord. She is currently employed with Southern Eye Associates where she is the Director of Marketing and Professional Relations.